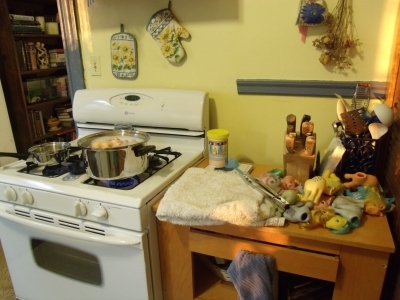 I start by popping off their heads, pulling out their tails, and removing the metal clamps and washers . . .
. . . and quickly realize that I do not have the patience for this. 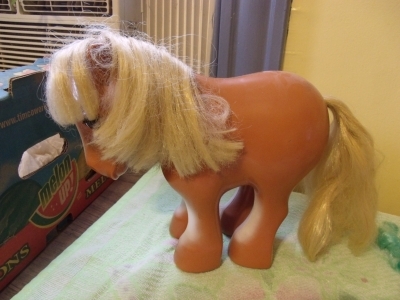 Not a single pony had gunk or mold inside its body, even the ones showing signs of tail rust. From now on, unless I see signs of tail rust or dirt inside their body, I'm going to leave the heads intact and not mess with the metal parts. I'm not planning to play with them in the bathtub anytime soon, so I figure if they aren't rusty after more than 25 years, I'm probably pretty safe. 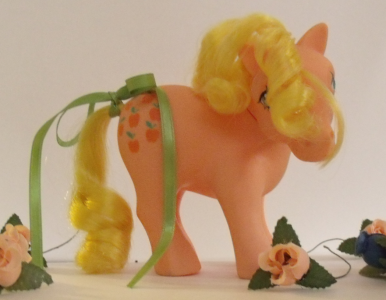 My poor Applejack would be in really good condition if it weren't for the smooze and straw textured hair. A good scraping with scissors (using my fingernails grosses me out) took care of the smooze. 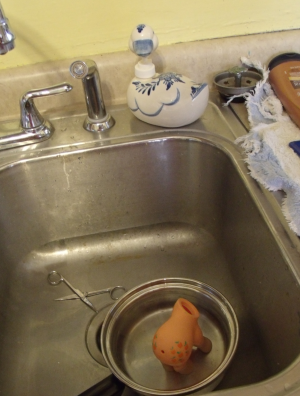 I dipped her in near boiling water and antibacterial soap was supplied by the trusty duck dispenser. She got a simple washing with a magic eraser and Dawn dish soap. I washed and conditioned her hair with Pantene Relaxed & Natural for Women of Color. 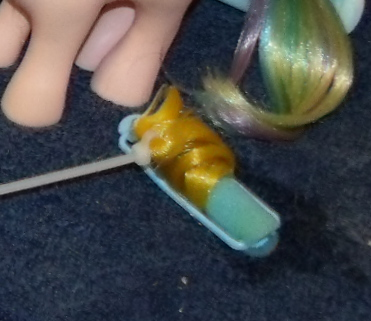 I absolutely swear by the stuff when it comes to pony hair. I use a regular plastic comb to comb through the hair while the conditioner is in it, once it's rinsed out, and after the hair is dry. I painted over the old symbols with Aleene's Tacky Glue using a camel hair craft brush specifically intended for glue. The glitter is a mix of silver and dark purple body glitter I found at Ben Franklin Crafts. 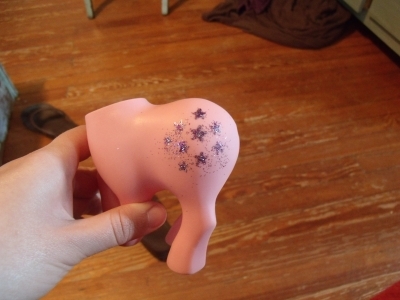 It was the finest glitter I could find and it's still significantly larger than Twilight's original glitter. She still turned out super cute! I was nervous about working on her hair. 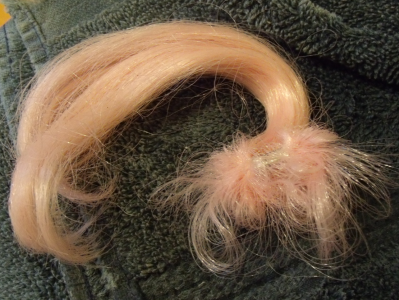 She had a lot of original factory curl that I didn't want to lose, but it was so coarse that it was worth the risk. Here's the pretty little girl! Her hair turned out great and she's mostly smooze free. 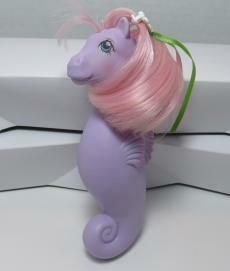 I was able to preserve most of the factory curl in her tail and both her tail and mane are super shiny and soft now. 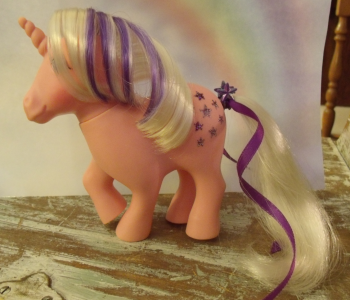 I had some trouble styling her mane, but I think it's ok. You can't see it in this picture, but one of her eyes is missing a fair bit of paint. My blue paint is too dark to mix the proper shade of green. It's not turning out bright enough no matter how much yellow I put in. I'll have to wait to fix her eye once I've picked up a different shade of blue. 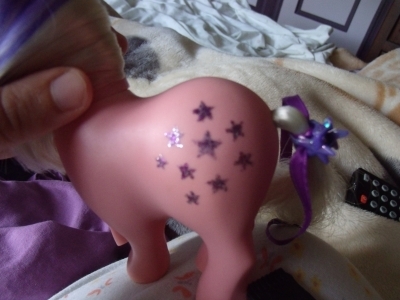 I did find a few interesting things inside the ponies. Cotton Candy's tail looked perfect from the outside. On the inside it was a tangled mess! Conditioner and a comb took care of that with no problem! 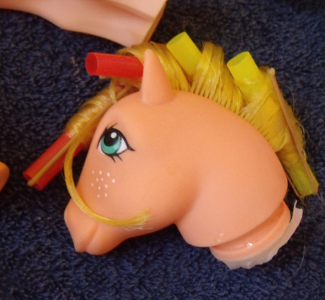 Windy had gunk on her insides, but ​it was only visible when she was wet. I ​didn't want to ruin her symbols by ​exposing them to Oxiclean, so I poured ​Oxiclean inside her body and then filled it with very hot water. I let her sit until cool and rinsed her out. Her insides came out perfectly clean! 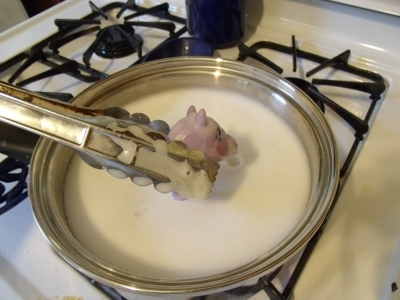 ​​I put pearlizing medium on all my unicorns' horns. When I was a kid I thought they looked funny growing out of their heads, like they just needed something. I started painting their horns and have done so ever since. 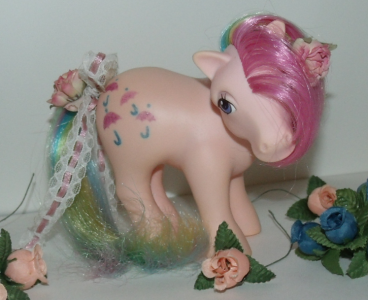 Parasol was my very first pony and is still one of my favorites. You can't really tell from this photo but boiling did wonders for her frizzy tail. I don't want to touch up her symbols, there's something about them being worn that just works for her. 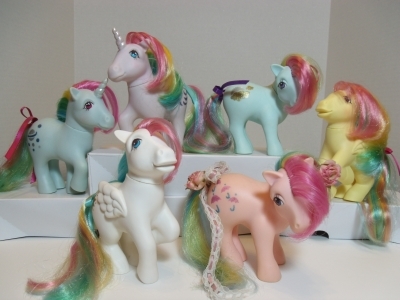 All my ponies in this pose were packed together because in my pony land they all live at the Show Stable. 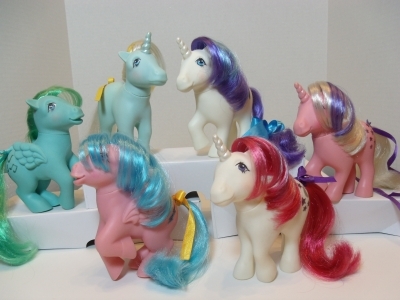 That's why collectors ponies and some playset ponies are pictured here. 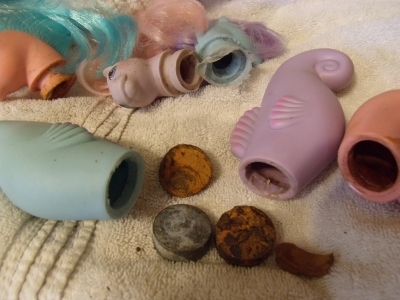 They mostly just needed to be cleaned and given some cute hair accessories. 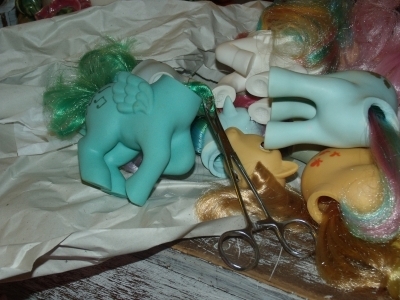 ​​FF Minty and FF Bluebell are both missing their tails. 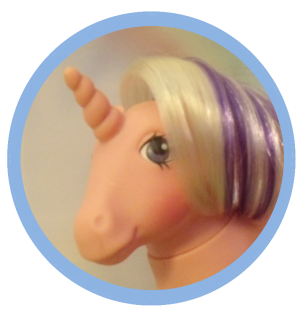 Bluebell also has a few cut plugs in her mane. I'm in no particular hurry so I'll wait to replace the tails and plugs when I have original hair to work with. Minty's hair is doing some funky poses in this photo. First off, those nasty weights making the Sea Ponies rusty had to go! 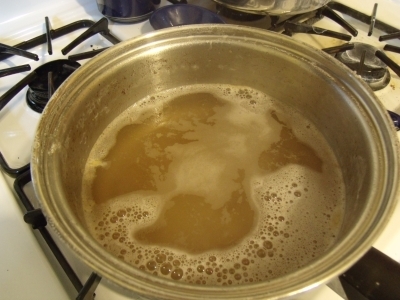 This is what the water looked like after they were boiled in OxiClean. Bleh! 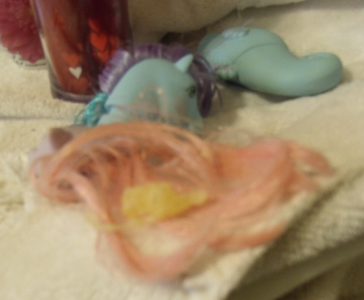 Some kind of weird yellow gunk came out all over Sealight's hair while she was boiled. I guess it was glue or something? Luckily it washed right out. 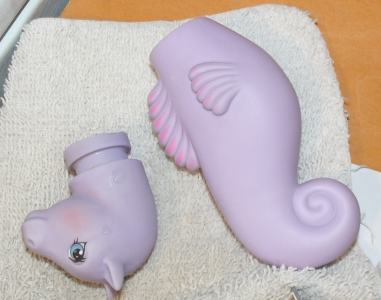 Sealight and Wavedancer were still a little rusty so they got OxiClean and hot water poured directly into them. They needed minimal scrubbing after this. 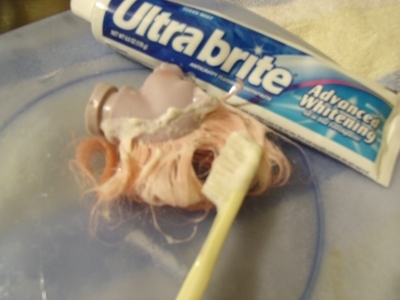 Whitening toothpaste will get rust out of manes too! 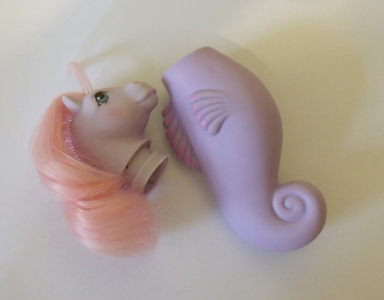 My biggest issue isn't the rust inside the sea ponies, it's the color of Sealight's head. It's easily three shades lighter than her body. Lots of things don't bother me but I can't stand it when head and body colors don't match. 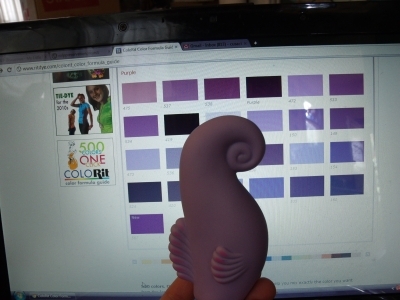 I decided to try to dye her head to match her body. It's not like it can get any worse. I wanted to keep her as original as possible so her hair had to come out before she could be dyed. I held her body up to the purple page on Rit's website and tried to pick the closest match. 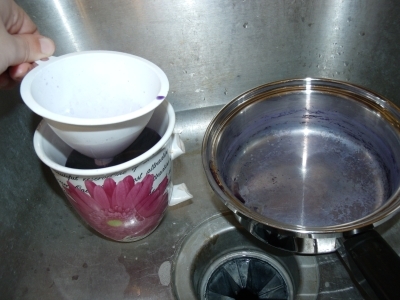 The color I chose called for 1 tsp purple and 1/2 tsp royal blue per cut of water. Continue to Year 3 . . .
She didn't need a lot. She had some scuffs that came off with magic eraser and her hair was a rats nest. 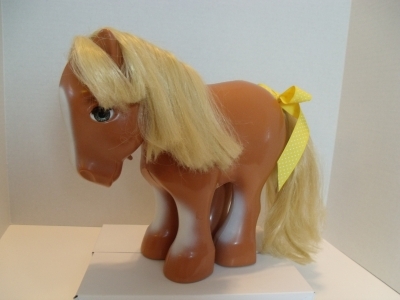 I was really nervous using a straightening iron on that weird straw textured hair. 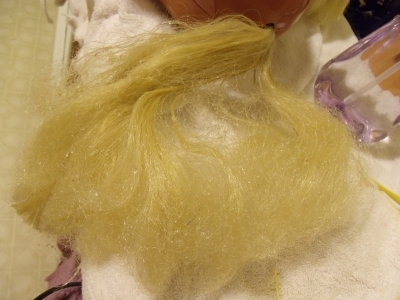 Since so many other collectors swear this works, so I dove in and it definitely helped tame her hair and didn't melt it. I probably could have gotten the tail even smoother if I wasn't being such a chicken about it. 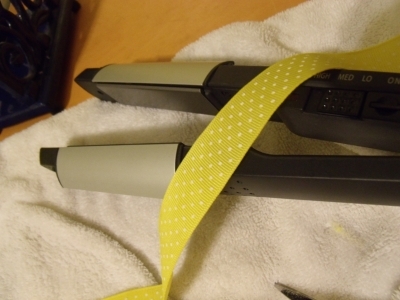 ​​Straightening irons are also great for flattening ribbons that have become wrinkled over the years. ​​Her eye mechanism doesn't work and I can hear it rattling around inside, but I don't want to risk putting cracks in her body so I will not be prying her open! 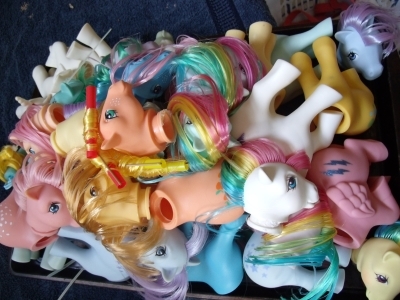 So what ended up happening is that a friend of mine gave me all of the ponies her son had as a kid. They were really mildewy but cleaned up nicely. 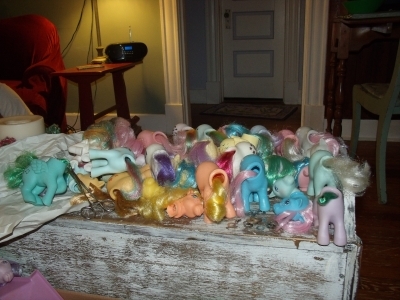 I took them to one of the pony meets and gave most of them away, but kept a few. One of them in the bag was Sealight. She cleaned up really well. 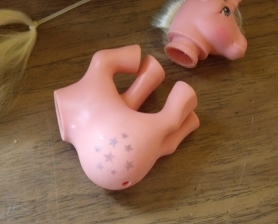 My first one had a nice body, and the second one had a nicer head, so I swapped them. 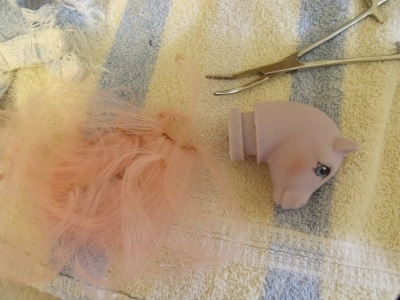 I basically ended up cleaning two ponies and got one near mint one out of it. 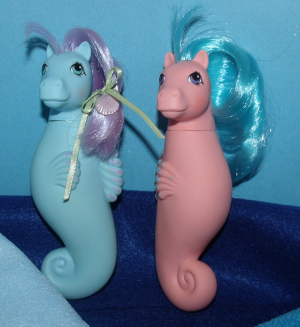 Seawinkle and Wavedancer turned out really pretty too! I'm absolutely floored by how well this turned out. Her head is probably a shade blue-er than her body, but it's soooo much better than before! 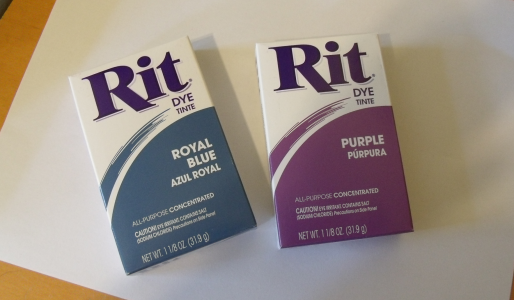 If I could do it again I would use straight purple with no blue in it. Still, this is MUCH less annoying than the faded head.